Oh my, where do I start… don’t we all love a little action, some tingling thrill, along with hot passionate romance. A little distance from the loved one, tiny misunderstanding and then getting reunited by divine faith, or shall I say a practical, concerned brother. ‘Rescued By Love’ has all these elements and more. Naina meets handsome, tough, six-pack-abs-type Lt. Colonel Arjun, on the treacherous mountains of Laddakh, where she has been kidnapped by the terrorists. Macho Arjun and his team rescues, the petite Naina (love the name) and for four days, they walk to the nearest army base and love blossoms. But she has been promised to someone. Bound by moral code and honor, they sacrifice their love once and… again. Will Naina survive her heart breaking not once, but twice? Will Arjun ever put her above his self-inflicted principles? Shilpa Suraj keeps throwing these fantastic twists throughout the fast-paced story, with exceptional word-weaving skill. 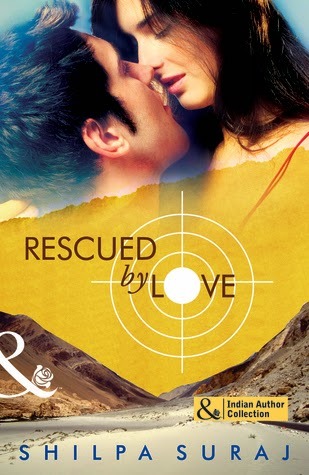 ‘Rescued By Love’ is a dazzling, sensuous, romantic story, right from the terrors of Laddakh to festivities of Goa, which keeps the reader on the toes of their mind J. The protagonists are charismatic yet rooted, beautiful yet relatable. The supporting characters are well etched, be it Arjun’s fiancée or his brother, Naina’s friends Ethan and Priya, even the army team members struck a chord with me. Superb narration with right balance of dialogues and prose, made Rescued By Love one of the most wonderful read. Tender, passionate, action packed page turner. Highly recommended!